The 2007 Carey Family Christmas came to West Central High School Saturday evening, Dec. 8th. Well known former WLLR Country Host Jack Carey entertained with a show of inspirational readings and holiday vocal music. It capped off an effort at West Central to collect canned goods to be distributed in the area's local food pantries. West Central students and attendees contributed some 1500 food items and $1257! Despite some icy conditions outside, Carey's friendly presentation and deep, warm voice won over the crowd as his vocals with soundtrack accompaniments took the audience on a tour of the most-loved and best-known songs of the Christmas season. Carey's message was one of hope and encouragement as he shared readings, stories, and songs while sharing his faith and beliefs with the audience. West Central FFA provided informal refreshments after the concert. Mr. Darrell Gittings is the West Central FFA Chapter Advisor, Jerry Keimig is President of the FFA Alumni Association, and Gene Turner is Pastor of the Stronghurst and Carman Methodist Churches, sponsors of the event. 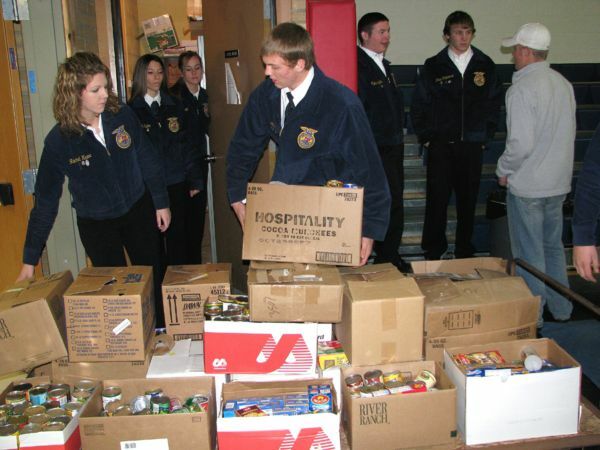 West Central FFA helped raise money for the Food Pantry. Altogether, the Heat, with the help of community members, brought in 1500 food items and raised $1257 to warm up the holidays for needy county families.